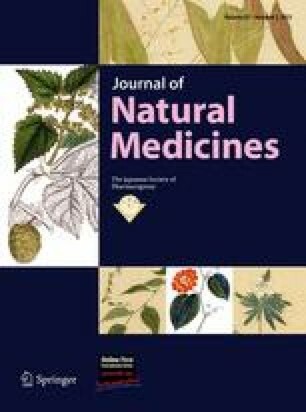 Two new cembrane-type diterpenoids (1 and 2) along with five known compounds (3–7) were isolated from leaves of Croton longissimus collected in Thailand. Their structures were elucidated from spectroscopic evidence and compound 4 was found by HPLC analysis to be identical to oblongionoside B—a compound isolated from Croton oblongifolius—including the absolute configuration at the C-9 position. The authors are grateful for access to the superconducting NMR instrument (JEOL JNM α-400) at the Analytical Center of Molecular Medicine of the Hiroshima University Faculty of Medicine, and an Applied Biosystem QSTAR XL system ESI (Nano Spray)-MS at the Analysis Center of Life Science of the Graduate School of Biomedical Sciences, Hiroshima University. This work was supported in part by Grants-in-Aid from the Ministry of Education, Culture, Sports, Science and Technology of Japan, and the Japan Society for the Promotion of Science. Thanks are also due to the Research Foundation for Pharmaceutical Sciences and the Takeda Science Foundation for the financial support.